Signed with address—1603 Mt. Vernon St.—in pencil on stretcher. Stretcher also bears an exhibit label from the Pennsylvania Academy of the Fine Arts. This is the earliest surviving of Trego’s paintings and the earliest example of his Civil War paintings. It documents the level of his skill at the time of his arrival at the Pennsylvania Academy in Philadelphia, where the painting was exhibited in 1880, the first of Trego’s works to be shown there. For an artist who would become known for his stirring battle paintings, this earliest Civil War–themed painting is noteworthy for its gritty portrayal of the realities of war. 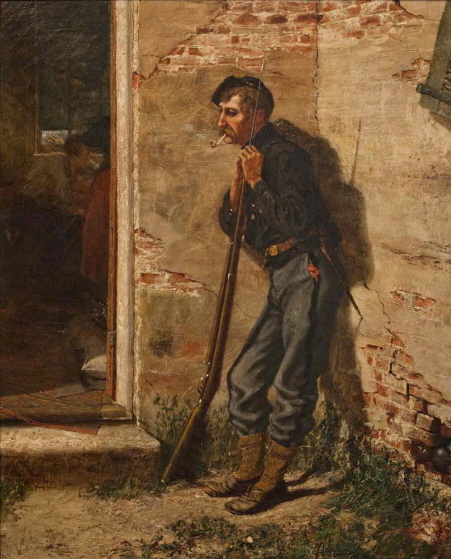 The lone guard in Union uniform leans wearily on his gun outside the open door of a house being used as a field hospital. A few feet to his left we see a cannonball embedded in the brickwork of the house, a large crack in the wall providing testimony to its impact. A shutter hangs from one hinge. The guard wears pants he has obviously crudely patched himself. His one foot protrudes through a gap in his shoe. Dimly, through the open doorway, we can see a bed, from which a hand is desperately reaching, and a doctor in his shirt sleeves bending over the wounded individual. Close by the door, a gray and apparently lifeless foot rests on a filthy mattress. Far from glorifying the war, this painting calls attention to the physical hardships of the soldiers and the brutal realities that confronted those wounded in battle. The details of this painting are crisp and clear, with some effects, like the brickwork and the foliage, seeming to stand out in relief. Sold to the current owner at Alderfer’s Auction in Pennsylvania, lot 455, 5 March 2003. Philadelphia, Pennsylvania Academy of the Fine Arts, 1880.